Grouping There are 4 products. Genuine WWII US grouping a WAC named Eva Northrop, containing her identity tags, ribbons and insignias and her medals. Genuine WWII Grouping which belong to Sergeant Peter F. Burkhalter, Medical Corps. This grouping contains insignias, pictures of him, a pocket book entitled "Make the war strengthen your marriage", a pocket guide to France, French invasion banknotes, his medical corps ID card and a surgical instruments set. Rare genuine British Indian Army Lieutenant-General uniform, identified to Lieutenant-General George Noble Molesworth. 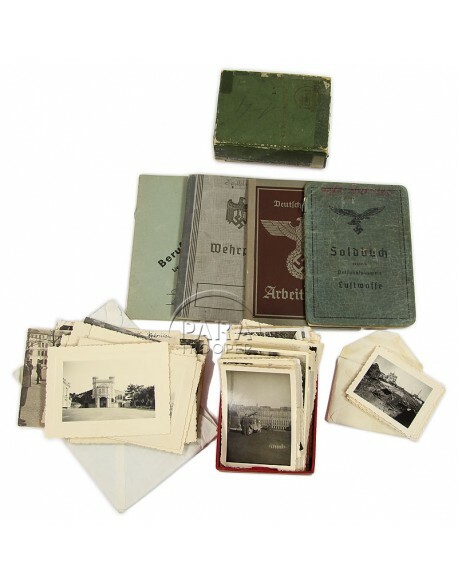 Very nice genuine WWII German grouping which containning a large lot of photographs from Western Europe and some personnal booklet like Luftwaffe Soldbuch, Wehrpass, Arbeitbuch and a worker booklet from the Hartleb family.